Last week I wrote about the social listening activity and the social media audit that students in my social media class (2017 syllabus) conduct. Both the activity and the audit assignment are done this year using Meltwater.com social intelligence software. If you have not done so, you may want to first read about the Meltwater university program in my first post. In the below post, I will briefly share how students in my social media class will also be using Meltwater to do some social listening for our class project. The class project involves taking on our department as a client and managing the department’s social media. As part of that project, students are in charge of monitoring the conversation around our department’s social media. Last year, my students used Microsoft Social Engagement which is a great piece of software that we also use in my Comm 435 Communication Research class (all posts about that class). This year, my social media class students will use Meltwater to do the social media listening. Students in my class use this spreadsheet to track metrics and to conduct their social listening. I’ve updated it from the 2016 spreadsheet to correspond with Meltwater. Students will use Meltwater to work on the “social listening” tab of that spreadsheet. The other tabs in the spreadsheet are about tracking our own performance. The social listening tab is for seeing what is being said about our brand every week. So, students go into this spreadsheet and fill out the below questions from weeks 9-15 of the semester. Specifically, the spreadsheet asks the students to answer 5 questions each week. I modified the questions slightly from last year because the last question from last year could not be answered with Meltwater. You can see this year’s questions below. A hint is provided to students on where to look to find this answer by mousing over each question. 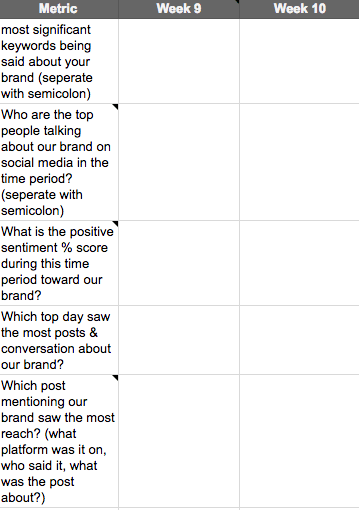 Even though students will have experience using Meltwater by the time we start doing the social listening about our brand about 8 weeks into the semester, I created a lab guide (about lab guides) to help students walk through the steps of answering these questions. My hope is that after they use the lab guide once, they’ll know what to do to be able to answer the questions. The lab guide is linked in the spreadsheet. You can also access it directly here. If you are new to using Meltwater, the lab guide walks you through how to do some basic social listening. I encourage you to check it out. In summary, I’m super excited about the growing opportunities my students have had to work with industry software like Meltwater and Microsoft Social Engagement to get real world experience with social listening. I know many of us have worked hard in the last few years in seeking out opportunities like this. And I am extremely pleased that companies like these are making their software solutions available to our students. It matters a lot! I know that my students will leave Shepherd with hands on experience using the same industry software used by many of the largest brands. I hope you found this post helpful. If you did, please share it. It helps a lot. In my previous post I talked about how my social media class will be participating in the Meltwater university program this fall. If you missed that post, check it out. It contains more info about the program and the Meltwater software. In the below post, I will discuss my current plans to use the Meltwater media intelligence software in a 300-level strategic social media course. Most of my students have searched social media sites for their own personal uses. But, before taking my class, few have had to put themselves in the seat of an organization that wants to see who is talking about them. So, to get students thinking about why an organization would want to monitor the conversation about its brand and the sort of things the organization would want to monitor, I start students out with a brief lecture an a simple in-class exercise. In the past, my social media students have used a slew of free tools to complete some of the early social media listening activities that I like to assign to get students thinking about the value of social listening. This semester, students will use some of those tools. But, we’ll be adding Meltwater to really round out these activities. Using free tools is fraught with dangers. The two biggest dangers are 1) the possibility that the free tool will be here today and gone tomorrow (think topsy.com) and 2) that they tend to be limiting. It can also be frustrating when using free tools because each free tool only provides so much. So the chance to use real, industry software in my class this year for these activities is a huge leap up. 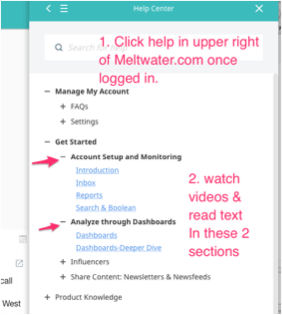 After the awesome training that Carol Ann Vance provided our students last Thursday, my students were given the following homework: Watch the training videos on the Meltwater platform (see image below) and to create a new dashboard for a social media search of interest to them. Now that the students have played with Meltwater a little, I then provide them with a more structured activity using the software. After a lecture on the importance of social listening along with some tips, the plan is to get the students using Meltwater for an in-class activity. The in-class activity asks students to do some basic social listening for a brand. I choose Burt’s Bees because its a brand many students are familiar with that meets a specific niche: environmentally-conscious health and beauty products. Many people love Burt’s Bees, health & beauty blogs and YouTube channels are a big thing and Burt’s Bees is sometimes featured in videos by influencers in this space, and Burt’s Bees makes a variety of products. I also choose Burt’s Bees because some people have complained about allergic reactions to their products and because I know that they have received some backlash when they were bought out by Clorox several years back( the company was seen by some as selling out to their antithesis, a company that creates products using harsher, less environmentally-conscious chemicals). Of course, you could do this exercise with any brand. I’m hoping that the students will uncover a diversity of sentiments about the company by doing this activity. And often times, the students aren’t aware of the negative feelings people have towards the company until they do this exercise. So it’s eye opening for the students to see how much they can learn with some basic social listening. The activity takes about 15-20 minutes to complete. During the activity, I go around the room and help students use the software and make sure everyone has a grip on it. Afterwards, we discuss what the students found and look for themes. You can access the activity through the following Google Doc. Feel free to make a copy and save it to your own Google Drive account. The activity is not too complicated and fairly easy for the students to pick up. But it is a great way of getting students’ feet wet. Using analytics software can feel intimidating at first. So this is a nice, comfortable experience for the students. The students are now prepared for the social media audit assignment. In that assignment, the students use Meltwater and free tools to conduct a social media audit of their client as well as 2 of their client’s competitors. Dr. Gallicano has some great examples of social media audits completed by students on her blog here. You can see a few of them cited in my social media audit assignment below. The students compare and contrast the client to the competitors and look for recommendations to the client on how they can improve their social media. The client in my social media class is our department’s social media, but you could apply this to any industry. (Read more about how I set up our department’s social media as the class client). The assignment is a group assignment with some time given to students work in class. The assignment is the first major assignment students do in my class and is the foundation for creating the strategic briefs the students create after that. You can see a copy of the social media audit assignment below or on my SlideShare.net account. Specifically, you can download the social media audit assignment here. In the next post, I will discuss using Meltwater to do social listening about a class client over the course of many weeks during the semester. Now, More than Ever, We Must Teach Skills and Abilities. Here’s a Quick and Easy Framework for Doing So. My Public Relations Class Participated in the Ketchum Mindfire Challenge. Here's How It Helped. A Social Media Education Blog by Matthew J. Kushin, Ph.D.
Join the Social Media Syllabus community. Get notified of new posts.